order now A neighborhood watchdog group recently formed to oversee Montgomery-Gibbs Field has raised a number of red-flag issues about the airport’s ongoing master plan update including noise, proposed airport runway expansion and the facility’s continued use of leaded fuel. buy now Runway expansion to accommodate larger jets is one proposal in an ongoing master plan update for the 456-acre, three-runway Montgomery-Gibbs Executive Airport at 3750 John J Montgomery Drive in Kearny Mesa. buy now Reaction to that, and other issues, has spurred surrounding Navajo and Mission Valley residents to create the Montgomery-Gibbs Environmental Coalition. MGEC is committed to ensuring residents’ concerns about planning for Montgomery-Gibbs Airport’s future are properly — and fully — addressed. Leaded fuel use tops MGEC Executive Director Sandra Stahl’s airport priority list. Stahl and others from MGEC have begun canvassing local civic groups, including the Clairemont Town Council. Concerning leaded fuel use, the city of San Diego said that’s not in their domain. Ian Gregor, FAA communications manager, said the leaded fuel issue is being studied. Other MGEC members and their supporters weighed in with their Montgomery-Gibbs Airport concerns. Marcelo Bermann, of Kearny Mesa, said airport noise in the area has gotten decidedly worse. “Sometimes I have 12 to 14 airplanes making racket flying over my backyard — it’s unconscionable,” Bermann said, pointing out there are only two flight paths planes from Montgomery-Gibbs can take over Kearny Mesa. MGEC has an existing Facebook page and a website under construction. Montgomery-Gibbs Executive Airport is a public-use airport owned and operated by the city of San Diego and its Airports Division, a branch of the city’s Real Estate Assets Department, which oversees operations at all city-owned airports. 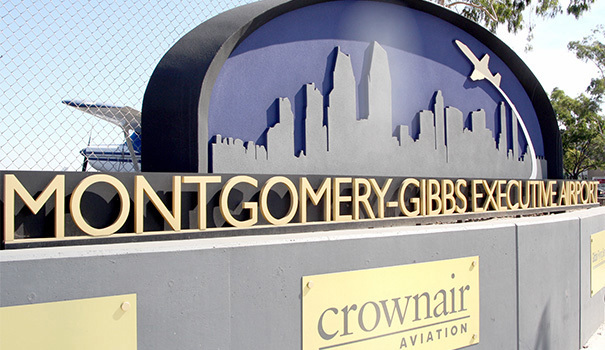 Montgomery-Gibbs is home to a number of facilities providing an array of aeronautical services including fueling, hangaring, tie-down and parking, aircraft rental, aircraft maintenance, flight instruction, hangar rentals, air charter and medical transport. The city’s Airports Division has embarked on a master planning process to define the vision to guide airport development at both Montgomery-Gibbs and Brown Field airports for the next 20 years. When finished, the airport master plan update for Montgomery-Gibbs Executive Airport will include reports of existing and future conditions, as well as providing airport layout plans and a schedule of priorities and funding sources for any proposed improvements. — Freelance writer Dave Schwab can be reached at dschwabie@journalist.com.